Louder Than Long Beach 3!! 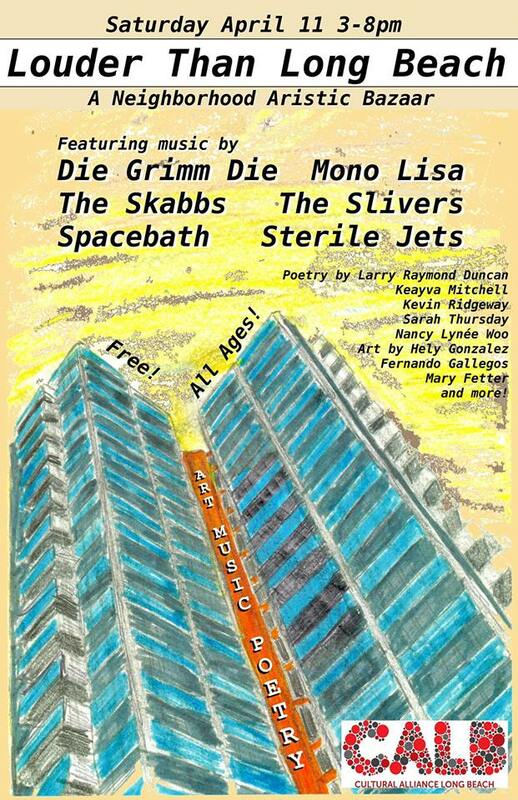 On Saturday, April 11th, Long Beach will once again be taken over by the artistic mash-up that is Louder Than Long Beach. Music, poetry, and art will be dancing together at CALB on Pine Ave from 3-8 pm. Poetry magicians, Larry Duncan, Keayva Mitchell, Nancy Lynée Woo, and Kevin Ridgeway will be casting their spells along with a special dual reading by Raquel Reyes-Lopez and myself. Six bands and several artists, including Fernando Gallegos, will also be strutting their stuff. In addition, Lucid Moose Lit and Sadie Girl Press will have plenty of books to browse. The best part (like there needed to be a better reason) is that all of this is free! The Cultural Alliance of Long Beach (CALB) has the mission of bringing you incredible events like these for free, just to keep Long Beach the cultural bounty it is.